Fragrant spices and lime come together for a flavor explosion on cod filets. This is a super easy, quick, and healthy meal for busy weeknights! In a small bowl combine all of the spices and mix well. Using 1 tablespoon of olive oil, brush the cod filets and then rub the filets with the spice mixture. You will use the entire rub – so make sure to coat them very well. Refrigerate the cod filets for at least 30 minutes, or up to 12 hours. Preheat the oven to 450º. Place the cod filets on a foil-lined baking sheet and roast in the oven for 10-12 minutes – the fish will flake easily and be opaque throughout when it’s cooked through. Meanwhile in a small saucepot, melt the butter with the remaining tablespoon of olive oil. Add in the lime zest and juice and swirl the pan to mix. 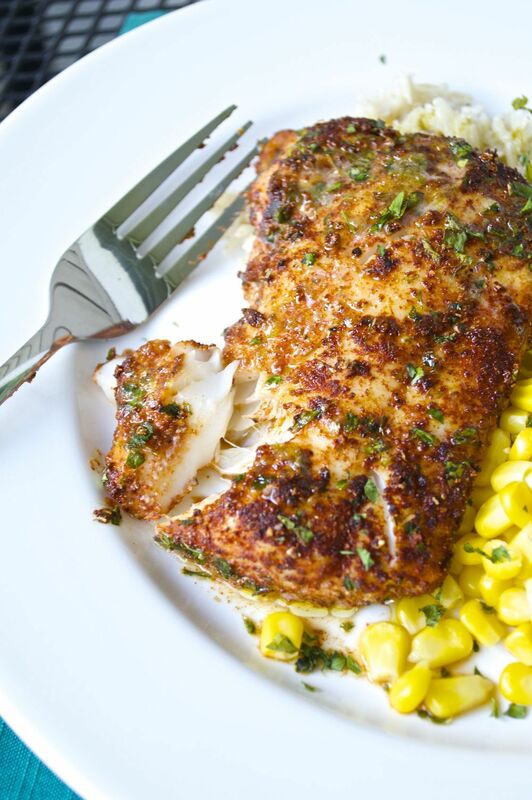 Serve the cod overtop of brown rice and corn, if desired, and top with the lime butter. *This recipe is for 2 servings. If you want more you can adjust the spices as necessary - they are very easy to double. You can even double or quadruple the recipe and store any extra in an airtight container to have on hand. This rub will work on all kinds of fish or poultry - it's a good one to have in your pantry! 0 Response to "Chili-Lime Cod Fillets"